Tesla has been on a Model 3 VIN registering spree since the start of this month. The electric car maker has registered 20,715 Model 3 VINs this month, that’s just 357 units shy of what Tesla registered in July. Though VIN registration is not a 100% reliable tool to gauge production rate, Tesla registering more than 20,000 VINs in July and following that up with another 20,000 plus registrations in the first eleven days in August is a good indication that the company is hitting the strides with respect to Model 3 production. 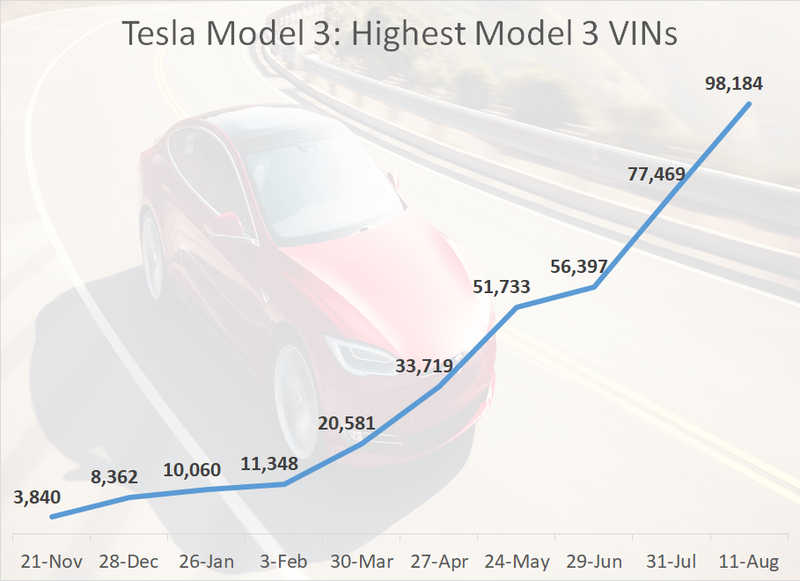 A quick look at the highest possible VINs Tesla registered at the end of every month shows how the production has been set on a steep upward slope. Tesla went from a weekly max production capacity of 793 Model 3s at the end of fourth quarter 2017, to more than 2000 cars by the end of first quarter and then accelerated to more than 5000 cars by the end of second quarter. An equivalent of moving monthly max production capacity from 3,000 units to 8,000 units and then to 20,000 units. It’s a bit likely that Tesla is inching closer to 6,000 units per week production rate. As Tesla kept building more cars this month than what they did in the previous month, the company had to keep registering more VINs every month to account for additional units coming out of the line. That is why we are seeing a sharp upward curve in VIN registration. Further increase in production, moving from 8,000 units per week to more than 10,000 units per week is not going to happen in a hurry. The company says that it can eventually reach a production capacity of nearly 600,000 units in its production facility in the United States. But no one outside Tesla knows how much of that capacity is going to be set aside for Tesla Model 3 and how much is going to Model S, Model X, Tesla Semi and the Roadster. And there is Model Y to think about. But whatever the way we slice it, Tesla is in no urgent need to increase production from 6000 Model 3s + 2,000 Model X and S per week. So things will slow down over the next few months. Expect the Tesla VIN Curve to start moving sideways over the next six months. And that’s a good thing unless you are staying on the short slope of Tesla. Tesla has now registered more than 40,000 Model 3 VINs in July and August. I am going to bet that Tesla’s is going to beat its guidance of 50,000 to 55,000 Model 3s for the third quarter by a mile. I predicted Model 3 production of 30,000 for Q2 two weeks before the company released its official production number at 28,578. Missed it by less than 1,500 units.